Pyloromyotomy is a surgical technique in which an incision is made on the muscles of pyloric end of stomach. There are circular as well as longitudinal muscles present on the pylorus. Pyloromyotomy is a surgical procedure used to treat a condition named hypertrophic pyloric stenosis. In this procedure, the longitudinal or circular muscle of the pylorus, which is hypertrophied, is cut off all along until the mucosa ooze out. If during this surgery, the mucosa get injured, it should be sutured horizontally. The sutures used are interrupted vicryl or silk suture. This surgery is also known as ramstedt’s operation. Pyloromyotomy is done to make the way from stomach to the intestine. As pylorus is the lower end of stomach which joins stomach with the intestine. A small incision is made longitudinally or circularly on the muscles of pyloric end of stomach. Then with the help of surgical instruments the inner mucosal lining of the stomach is bulged out of the incision made. This bulging out of the mucosal lining of pylorus will make a channel open from stomach to intestine. Then the incision is sutured and the suture used may be interrupted vicryl or silk suture. Pyloromyotomy is considered safe and curative surgical procedure. The mortality and morbidity rate associated with Pyloromyotomy procedure are very less i.e. less than 0.5 % and less than 10 % respectively. But there are also some complications associated with this procedure. The most common complication seen is duodenal perforation. Intubation may also be difficult being a complication, so it require prolong ventilation. These complications are intra operative complications. Some post-operative complications are as follows. Vomiting may occur and there are rare chances of sepsis due to Hirsch sprung disease. Adhesion and Bowel obstructions can also occur after surgery. In Pyloromyotomy, the most common side effects seen is vomiting. The patient may vomit right after surgery and may continue vomiting till 24 hours pass. This is because, the gastrointestinal tract may not accept the changes made to the pylorus and the reflex action occurs resulting in vomiting. The vomiting may be the side effect of pyloric stenosis. The stones in the pyloric end make the way block which transfer food to intestine and as a result, vomiting may occur. 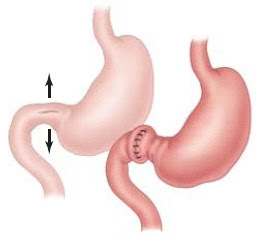 Pyloromyotomy make the opening of pyloric end of stomach wide in order to pass the food to intestine. In Pyloromyotomy, care should be taken during or after surgery. During Pyloromyotomy surgery, care should be taken while making an incision and bulging the mucosal lining out. The mucosa should not be injured that’s why extra care is required. The sutures used should be sterile. And after surgery the patient should be shifted to post anesthesia care unit which is abbreviated as PACU or the recovery room. The patient will stay there until he wake up and should be under complete observation. The visitors can meet him when he woke up after the effect of anesthesia diminishes.